← Progress of the Seasons Journal: 24 April, 1832-1862. Progress of the Seasons Journal: 25, 26 & 27 April, 1832-1862. Saturday was a warm day, and we were in Gallatin, Hudson and Copake, and out around home. Trout Lily starting up in Gallatin, Purple Trillium in Copake together with Canada Fly Honeysuckle; a cherryflowering in Hudson, together with Norway Maples. Aspen and Cottonwood widely in bloom. Spicebush open in a couple of locations, including Harlemville. Here, after some delay, is the historical phenology report from the ‘Progress of the Seasons Project’ for 25-27 April. 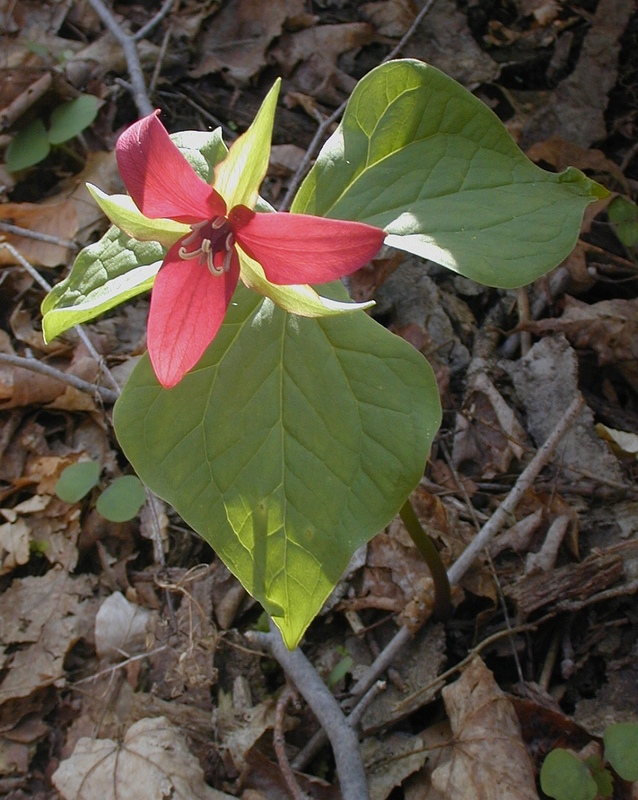 Red Trillium (Trillium erectum), our most widespread Trillium species. Most of us in these parts know Purple Trillium; in fact, it is now blooming here in the mid-Hudson Valley. But there are other Trilliums (or should that be Trilli?) also opening up. 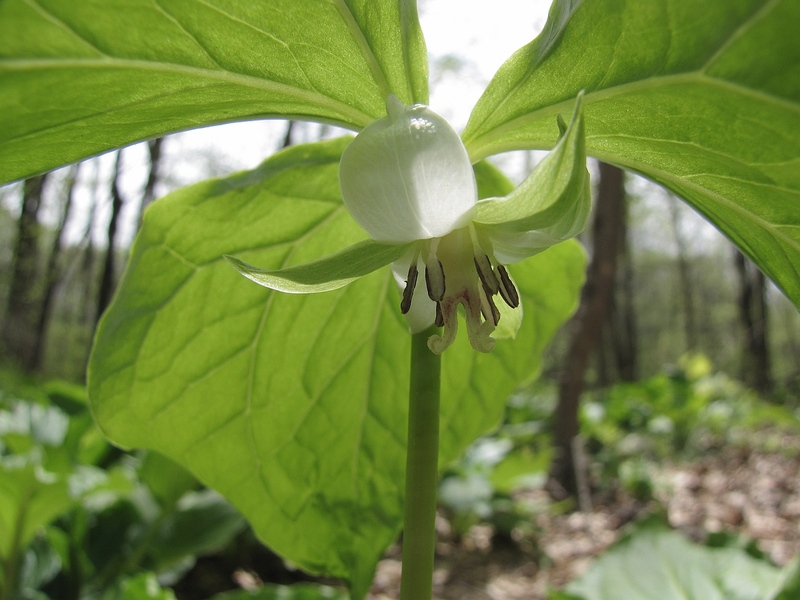 In the records below, at least three species are noted: Trillium erectum (the familiar Red Trillium), T. sessile (the nicely-named Toadshade), and T. pendulatum (an archaic Latin name for the Painted Trillium). Toadshade, is, unfortunately for our Toads, a western plant. Recorded in NYS, as shown in these data, only from Western counties. Painted Trillium (Trillium undulatum), an eastern hill species in Columbia County. Trillium cernuum or Nodding Trillium. Known from the more western part of the County, this is from Art Omi. However, we do have three Trillium here in the mid-Hudson Valley, in addition to Red and Painted Trilliums, we have Nodding Trillium (T. undulatum). Both of our white Trilliums are relatively rare, while the Red Trillium, while not abundant, is more frequent. 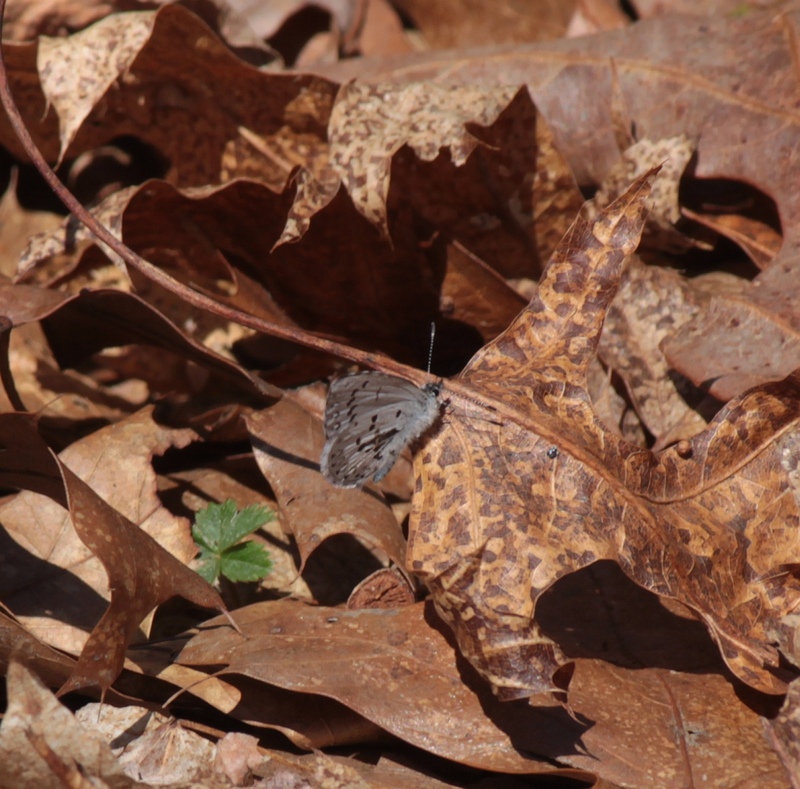 In Columbia County at least, the two White species don’t overlap, with Nodding being a Hudson Valley species and Painted a species of the Eastern Hills. The earliest Hummingbird record in our observations was noted from 27 April 1836 in Canajoharie. Thrushes (Wood Thrush?) also make one of their earliest appearances, at West Point. Aside from the Swallows (mostly Barns but at least one record of Cliff Swallows, Chimney Swifts, and Martins), it was also a very Whippoorwillish set of days, spiced by a couple of Yellow Warblers and wandering ‘herds’ of Passenger Pigeons. Some of those Swallows may have known each other on their wintering grounds. During the colder months, they all appear to overlap in NW South America (for example, Columbia). The Barn Swallow apparently ranges throughout South America. The Chimney Swifts are more restricted to NW South America, while Martins and Cliff Swallows also include large, central portions of the Continent. Two other Swallow species, absent in the below records, are Bank Swallow and Tree Swallow. The former appears to approach the Barn Swallow in wintering range, but the Tree Swallow seems to come no farther south than Central America. 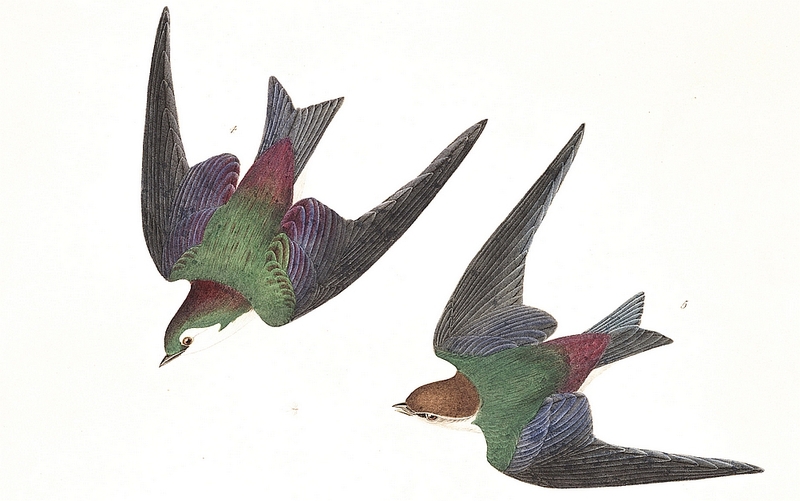 Part of Audubon’s image of the Bank or Violet-Green Swallow. See the Audubon Society’s page for more images, http://www.audubon.org/birds-of-america. Herbs: Wood Anemone, Hepatica and Trailing Arbutus flowering in Chatham on these dates in phonological history. The trim Bluets seen near Amenia. Willow Herb, Trout Lily, Wild Strawberry and Dandelion bloomed near Spencertown. Finally, Bloodroot flowers were spotted near New Lebanon in 1851, and Plantain-leaved Cudweed flowered two years earlier in Amenia. Woodies: A variety of woody plants were in flower on these dates: Red Maple in New Lebanon; Black Cherry near Fishkill Landing, Pinkster (a Rhododendron) at Spencertown and Shadbush at Kinderhook. Meanwhile, Lilacs leafing out in Spencertown, and White Oak and American Elm were greening up at Fishkill Landing. Birds: Barn Swallows were recorded on these dates thrice in Kinderhook and once in Poughkeepsie. “Swallows” (perhaps also Barn Swallows) were first noted at New Lebanon on 27 April 1853, and, in two different years, in Kinderhook. Bobolinks (which we’ve yet to see) arrived in Kinderhook on 27 April, in the year 1845. Three years earlier in the same place, Martins were noted. Flocks of (Passenger?) Pigeons were spotted near Hudson on 25 April, 1832. Other Critters: “Tree Toads” (almost surely Grey Treefrogs) were heard near New Lebanon. This is our earliest record of this species in all of our accounts. A mystery photo for those of you wanting a challenge. This is currently flowering hereabouts. Agriculture: In 1845 & 1846, Cherries and Peaches bloomed in Poughkeepsie on these dates, while in 1844 they both flowered in Kinderhook. 1846 also saw Plums in bloom in Poughkeepsie. 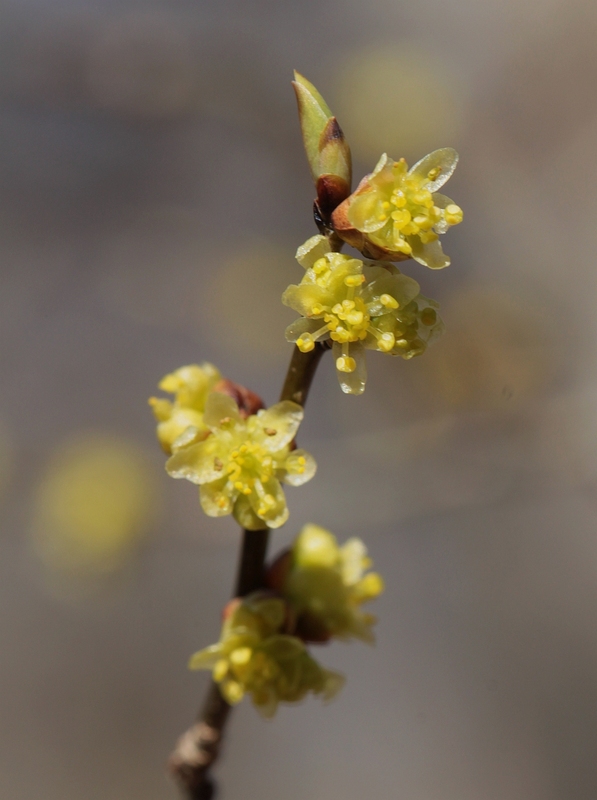 Pear flowering was reported at Poughkeepsie, and Gooseberry, Red Currant and Blackberry were leafing out at New Lebanon, Spencertown and Fishkill Landing, respectively. Herbs: Around the house, Daffodils seem to be dwindling in our records, with only one record of a flowering Daffodil reported from this date. Myrtle also seen in flower. Dandelions still notched up three records. Amongst the other ‘weeds’, Henbit, Narrowed-Leaved Plantain and Sheep Sorrel flowering. The Violets reported from New York County may have also been yard flowers. In the woods, at least three records of Rue Anemone in bloom, plus a couple of records each of Marsh Marigold, Spring Beauty and Columbine. Toothwort, Two-leafed Miterwort, Trout Lily, Hepatica, Saxifrage and Rue Anemone had one observation a piece. Woodies: The Maples are were getting up to speed by these dates. Five Red Maple flowering records plus one of our first for a flowering Sugar Maple. Silver Maple leafed out suring this period on two different occasions during the 1850s. Horse Chestnut bloomed on two occasions, as did Basswood. Else a diversity of flowering trees in the forests: Birch, Chestnut, Flowering Dogwood, English Hawthorn, Tulip Tree, Sweet Briar, Elderberries and Whortleberries (a Vaccinium) each reported to flower in one instance. Under domestication, a Yellow Rose and four records of Lilac in flower. Shadbush trundling along with five records of flowering during these dates. . Birds: Swallows and kin settling in comfortably, with Barn Swallow arrivals reported on six occasions, Chimney Swifts on two, Cliff Swallows on one and Martins on a pair. Plain old “Swallows” were noted in three reports. (Red-winged) Blackbirds arrived on April 25, 1844 to Queens, while “Thrushes” were noted in 1853 at West Point. A trio of reports for the arrival of Whippoorwills (more often heard than seen). 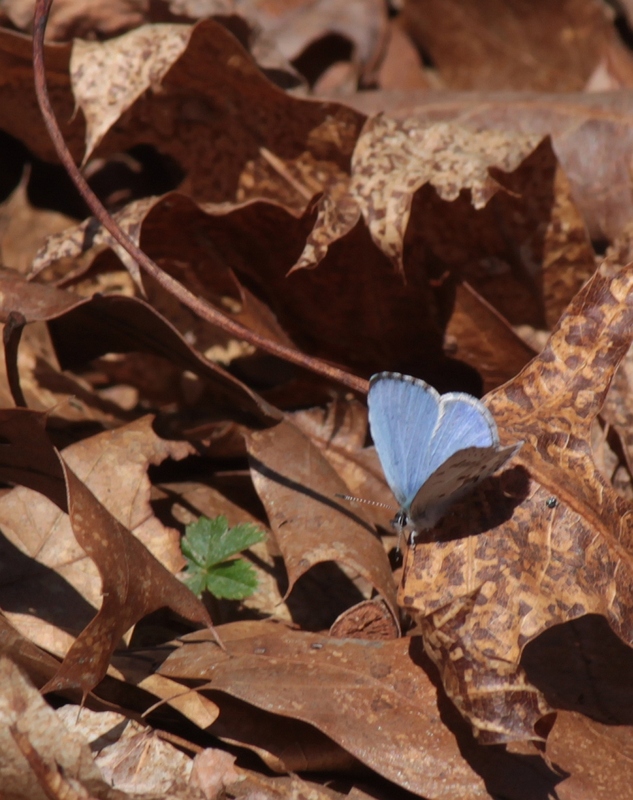 One of our earliest Spring-hatched butterflies, the aptly-named Spring Azure (see adjacent picture for open-wing view which will explain “azure” portion of name.) This photo was taken over the past weekend in Gallatin. Other Critters: On one instance each, butterflies flew and Frogs called. Agriculture: Apples began blooming at three locations, Apricot at four, but Cherries are far in front with 14 reported flowering dates; Currants are close behind with ten records. Flowering Almonds were reported in bloom at two sites, and Gooseberries at three. Peaches bloom was recorded on six occasions, Pears also on six and Plums on seven. Strawberry’s white flower showed thrice in the records for these dates. Apple leafed out at two sites, and there were single records of Red Currant and Blackberry. Finally, Lettuce was reported cut on these dates in 1842, and “on the table” in 1845. There, does that explain the “azure” part of the Spring Azure’s name? We appear to have several Azure species here, but whether there are a few, quite variable species, or many relatively constant species seems to not yet be clear. Woodies: Aspen and Shadbush flowered. Agriculture: On this days in 1802, Pear and Plum were blooming at Kingston. Plum also picked this date to bloom in 1840, and Apple chose it in 1845. Birds: Two Swallow records and two for Martins, plus a late-arriving Robin (1837) and a Cedar Waxwing. Other Critters: Two first records of Frogs on this day. Agriculture: Three notes of blooming Plums and one of Apple. Herbs: Daffodils bloomed ‘round the house, and Spring Beauty, Hepatica and White Violet in the woods. Woodies: Elm and Red Maple bloomed. Birds: Four Martin arrivals, and one for Swallows. Other Critters: Five, count ‘em, five records of first frog calls. Herbs: The flower gardens were unfolding with Daffodils noted on four occasions, Dandelions on three; and Iris, Myrtle and Narcissus with one record each. In the forest, Anemones, Jack-in-the-Pulpit, Marsh Marigold, Trout Lily (twice) and a Trillium show up in the flowering history. Woodies: Shadbush is flowering here too. Ruby Throated Hummingbirds, whose arrival was first report in our records during these dates. 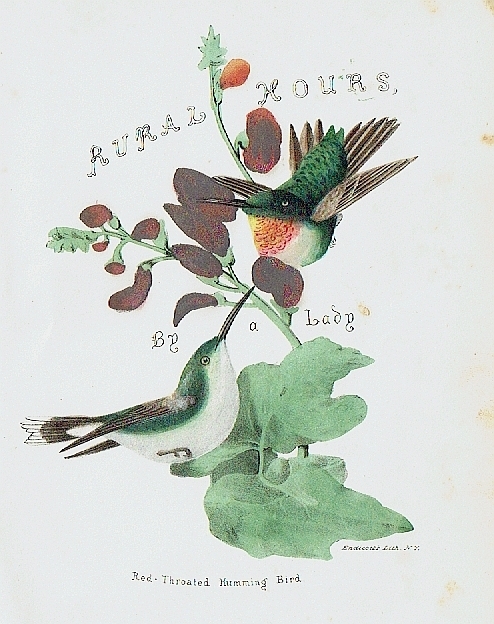 Image is the title page of Susan Fenimore Cooper’s book, Rural Hours. Birds: Three records of Swallows, and one of Martin and of Whippoorwills. Hummingbirdsbuzzed in for their first record in all of our data. Agriculture: Apples and Cherries were seen to flower during two different years, Currants during three years, and Plums also during three. Herbs: Daffodils and Spring Beauty, mas nada. Woodies: A pair of Lilac records, and one each for Red Maple and American Elm. Birds: When the Swallows return to Palermo (Oswego County), six first swallow records on these dates for that town, plus one more from elsewhere in the region. Three Martin returns. Yellow Warbler also noted one year. Agriculture: Gooseberry, Red Currants and Red Raspberry in leaf; Currants and Plums (twice) in bloom. Herbs: Four Dandelion records and three of Daffodils, Hyacinth and Primrose also in the gardens. Bloodroot, Trout Lily (twice), Hepatica (twice), Saxifrage and Marsh Violet spiffing up the wilder haunts. Woodies: Shadbush recorded as spotting the hedges with white on five instances; Red Maple on four occasions, Sugar and Silver each once. Birds: Five records of the appearance of Swallows and nothing more. Other Critters: Frogs in Ithaca. Agriculture: Ithaca saw flowering Apricots on 26 April 1848. Cherry flowering was widespread with nine instances on record. Currant blooming was written down on five occasions. Six Peach, two Pear, and four Plum flowerings. Gooseberry also seen to bloom (twice). Apple and Red Currant in leaf. And, on Friday, 25 April, 1856, ploughing began in Onondaga County. Herbs: Diligent Chester Dewey noted the flowering of three different sedges on this date. Else the forests were waking up, with Jack-in-the-Pulpit, Marsh Marigold, Spring Beauty (twice), Toothwort, Trailing Arbutus (twice), Trout Lily (twice), Hepatica (twice), May Apple, Saxifrage and Red Trillium all showing up in his records for these days. Woodies: Maples en force here as well, with one flowering record of Silver Maple, one of Red, and one of Sugar, plus one Red Maple leaf-out record. Tiny Beaked Hazel (see our last mystery flower) was noted, as were the trim yellow flowers of Spicebush (which is currently blooming here). The native Balsam Poplar and Trembling Aspen had open, dangling catkins, as did a cultivated variety of Populus. Shadbush flowered during a pair of years, together with Willow. American Elm drooped its anthers, while, around the home, Snowball Viburnum and Lilac were reported in flower. Birds: Yellow Warblers were first seen on this date in 1848, together with Swallow records from three years and Martins from a single year. Other Critters: A Snake was seen! Agriculture: Asparagus in market, Currants in leaf, plus flowering records for Apricot, Cherry, Currants (two) and Plum. Herbs: Daffodils and Dandelions in the garden; Bloodroot and Hepatica in the woods. Woodies: Willow leafed out during these days in 1850. Birds: Swallows arrived on this date during two different years. Other Critters: Grasshopper first noted, and perhaps not welcomed (although, who knows!). Agriculture: Time for Plums – they were noted in bloom on five different occasions. Peaches bloomed during three years and Cherries during a pair. Apples, Apricots and Currants also flowered, and there was one report of Currants leafing out. Herbs: Daffodil bloomed, as did a Purple Violet and a Yellow Violet species. 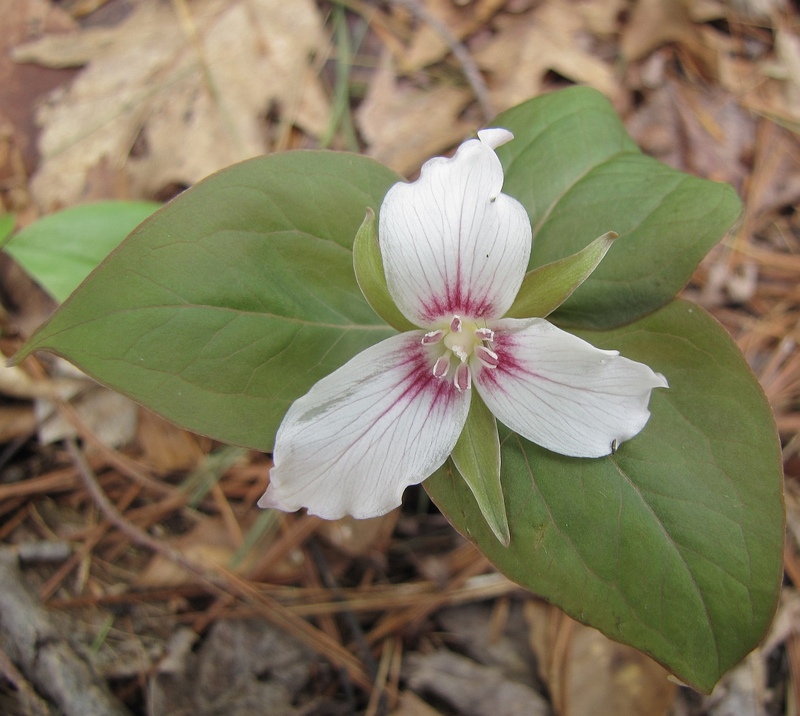 Three flavors of Trillium were said to have bloomed on these dates: T. pendulatum, T. erectum, and T. sessile. Woodies: Shadbush waking up on two occasions. Birds: Barn Swallows and (Passenger) Pigeons seen. Agriculture: Two instances of flowering Cherries, one each of Currants, Peaches, and Pears.